On Tuesday, June 2, 2015, we released a new cloud version of Apigee Edge. 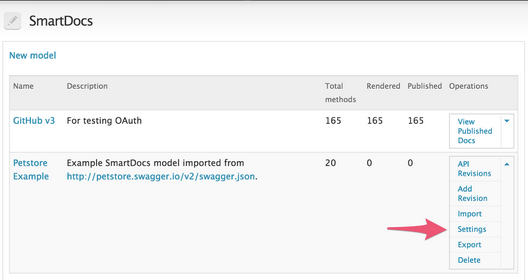 Support for Swagger 2.0, including import by file or URL, including support for custom-named security objects. Visual design improvements in the templates that generate SmartDocs. Usability and workflow enhancements in the Developer Portal, available through the Content > SmartDocs menu in Drupal. What has been known as "Custom Token" authentication is now called "API Key". Authentication "security" objects defined at the revision level. Configuration of client authentication at the template level. New revisions no longer reset any preconfigured SmartDocs client credentials. For more feature descriptions, see this blog post. For SmartDocs documentation, see Using SmartDocs to document APIs. Warning: If you have already been using SmartDocs during the beta period, you'll need to upgrade. See the SmartDocs upgrade process. A new beta version of the API proxy editor is available. 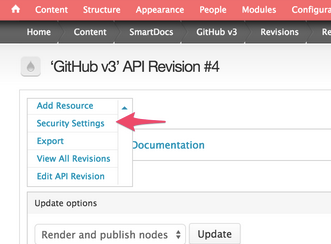 To access, click the "Access the Beta Version" link when editing an existing API proxy. You can switch back and forth between the "classic" and "beta" editors. The new DeleteOAuthV2Info policy lets you delete authorization codes and access tokens. For more information, see Delete OAuthV2 Info policy. The Access Entity policy provides access to the following new entities: consumerkey-scopes, authorizationcode, requesttoken, and verifier. For more information, see Access Entity policy. The SSL Certificates page in the management UI (Admin > SSL Certificates) indicates when SSL certificates are expiring within 10, 15, 30, or 90 days, depending on your selection in the new expiration drop-down field. Developer apps in Edge have both an internal Name that doesn't change and a Display Name that you can change. On a Developer App page in the management UI (Publish > Developer Apps > app name), the app internal "Name" is displayed along with the "Display Name", making it easier to visually identify apps by their internal names for troubleshooting and API management. The optional classic version of custom analytics reports is no longer available in the management UI. If you've already been using SmartDocs during the beta period, new features and capabilities in the general availability version require that you upgrade SmartDocs in your developer portal. Any SmartDocs pages that have already been published in your developer portal will continue to work, but you must follow the update process before editing or publishing any changes to existing or new pages. Keep in mind that while you can render and publish SmartDocs inside your developer portal, SmartDocs are generated from the API model that lives within Apigee's Edge API Management Services. Any changes you make to an API model in Edge will be the same across all your Pantheon environments (similar to how developers exist across Pantheon environments). Update and test the 15.05.27 release in your dev or test environments on Pantheon. Create a new model to replace any existing API model you have been using. If you have been importing Swagger or WADL documents, import them again into a new revision. If you have been maintaining your API model via the SmartDocs module, export as SmartDocs JSON and import into your new model using file attachment. Set the security properties of the revision of your model. On the Content > SmartDocs > model page, select Security Settings. Check any pre-configured authentication in the model settings page (Content > SmartDocs) by clicking Settings in the Operations column. Update any custom templates to use v6 of the CSS and JS assets, and make changes to reflect any new object names, such as authSchemes and apiSchema. For information on updating SmartDocs templates, see Using SmartDocs to document APIs. Re-render and publish your model revision. After validating the new documentation, update your production portal to the 15.05.27 release. If you are an Edge enterprise customer and have questions or concerns about the upgrade process, please email marsh@apigee.com and cnovak@apigee.com. Otherwise, please use the Apigee Community for the best response. Similar to ProxyEndpoint, the TargetEndpoint will be validated for the proper schema and expressions used in the conditions during the API proxy import.